This is the BLOOD of the COVENANT! ... Why didn't Jesus say this ON THE CROSS??? 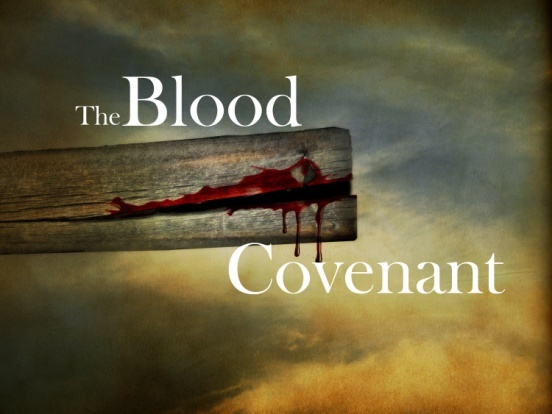 True2Ourselves Forums > Community Topics > Theology > This is the BLOOD of the COVENANT! ... Why didn't Jesus say this ON THE CROSS??? ... When the Blood was being shed??? The Blood of Christ, during His Passion, was pouring down his face and arms and body and down the wood of the Holy Cross and unto the ground before Him. So why oh why didn't Jesus say "This is the Blood of the New Covenant" then??? It was not because Jesus couldn't speak. We know that He spoke seven words/sayings from the Cross. So that can't be it. We know that there were believers present to hear him. His Mother, St. John the Beloved, and St. Mary Magdalene were there. So that can't be it either. (It's not because there were no believers to receive the message). Scripture records Jesus using the word "covenant" ONLY ONCE in the whole Bible. At what point was that? And WHY? is the key question. As you can see this is quite a bloody scene. Any detective who walked upon that area would think that there was a murder or homicide. But it wasn't just any killing it was a sacrificial offering and there was AN APPLICATION of that blood to the things of God, the book and the people! The blood had to be applied! NOTICE: the animals for sacrifice were already DEAD. Jesus wasn't dead while suffering on the Cross. So, ... where did Jesus speak about the shedding of blood? and the forgiveness of sins? (together)? On the cross? ... Not exactly. Why didn't Jesus say THIS IS THE BLOOD OF THE NEW COVENANT while the blood was everywhere on Calvary just like the blood was present at the time that Moses declared the Covenant? FOR THERE IS NO COVENANT WITHOUT BLOOD! So, how could Jesus declare the NEW COVENANT when He did? ... Doesn't there NEED to be BLOOD somehow actually present??? ... In some kind of real application to the people of God? Ah! ... Or was the Blood of the Sacrifice really, truly, and substantially present indeed?!? Hmm ... but you would need to walk by faith and not by sight to believe that. Praised be Jesus Christ, the New Moses! Last edited by AHJE : 09-16-2013 at 06:26 PM. Re: This is the BLOOD of the COVENANT! ... Why didn't Jesus say this ON THE CROSS??? What Jesus did and said at the Passover Meal, was Symbolic, He used the Bread as the Symbol of His Flesh, and the Wine as the Symbol of His Blood. That we should eat the Bread and drink the Wine in Remembrance of Him as He said. I don't understand why this is such an argument. When you and AHJE partake in the Eucharist it is exactly how each of you say it is. To you Jim, it is nothing more or nothing less than bread and wine and with Alex the Holy Spirit transforms it on a God known faith believing level to Flesh and Blood. That is the actuality of your positions and neither of you are lying. That is not to say either of you may wake up some day and change your positions but that would seem unlikely. Would you Jim, say the Holy Spirit doesn't have the power to do as Alex suggests\believes? ... Thanks for responding, ... but how is this a response to the OP and its questions? Before I give you my full answer, could you answer one question first? It means that Jesus is the New Moses as prophesied in the Book of Deuteronomy, that He is LIKE MOSES. Jesus used the word Covenant ONCE and He used it in the same pattern as Moses did. When Moses said it he was saying it when the Covenant was being ratified, the animal was dead, and the shed blood was present and being applied to the people. So, ... when did Jesus say the word "Covenant" in the Pattern of Moses? In his book Jesus of Nazareth, Pope Benedict pointed out that, in Matthew's gospel, when Jesus goes up the mountain, Matthew presents it as a parallel to Moses going up Sinai to receive the Law. But where Moses went up the mountain to receive the Law from God, Jesus goes up the mountain to proclaim the law as God. But how can this be? Jesus, after all, is standing there in the midst of his disciples – what is he doing? He is bringing to fulfilment what he said in the Good Shepherd discourse: “No one takes [my life] from me, but I lay it down of my own accord”. (Jn 10:18) His life will be taken from him on the Cross, but here he is already laying it down. He transforms his violent death into a free act of self-giving for others and to others. And he also says: “I have power to lay [my life] down, and I have power to take it up again.”(ibid.). He gives his life, knowing that in doing so he is taking it up again. The act of giving his life includes the Resurrection. Therefore by way of anticipation, he can already distribute himself, because he is already offering his life – himself – and in the process receiving it again. So it is that he can already institute the sacrament in which he becomes the grain of wheat that dies, the sacrament in which he distributes himself to men through the ages in the real multiplication of loaves. Many talk about the cross, what Jesus said, and how he died. As to why he died, and was dead for three days is pushed aside with a simple, "He died for our sins." 1) It was to save the human family from something. 2) If he died for our sins, we would not have to ask to be forgiven for all the sins we do. 3) Why did he have to be dead for three days? 4) How is Genesis 3:15 tied to Jesus death? 5) Would God make the whole human family die for what two people did? or is there a physical reason we die? 6) Did Gods plan for man go astray...do his plans not work? Why would the Romans hang Jesus on a cross, when they are known for using a stage. 7) What happens to those on a cross, as to being on a stake. 8) What was the cross before Jesus came? Wait, wait, wait, wait, wait, wait! You take the first chapter of Genesis literally? And listen to the way this question is framed. Remind of any serpent, er, anything?